For the third year, The Guardian Foundation is holding the Hugo Young Award for young people studying MA Journalism courses across the UK. The competition is for a political opinion piece and aims to highlight the talent of new voices entering the industry. The shortlisted students will be invited to the award ceremony at the Guardian in March 2019, and the winner will receive £500, have their piece published in the Guardian, and gain 1 week shadowing a senior Guardian political correspondent. Last year our very own Laura Trussel was shortlisted for the award. Let's see if we can keep up the trend shall we? Between 900 and 1,000 words. A strong argument and grasp of the facts. Broad, timely, national and international news topics. A subject you feel passionate about. We’re keen to hear from people from all backgrounds, about any kind of idea. Your piece should be suitable for publication toward the end of March 2019. Your piece should have a title and be in pdf format. You can find the full guidelines here and terms and conditions here. The deadline for entries is 3rd February 2019. 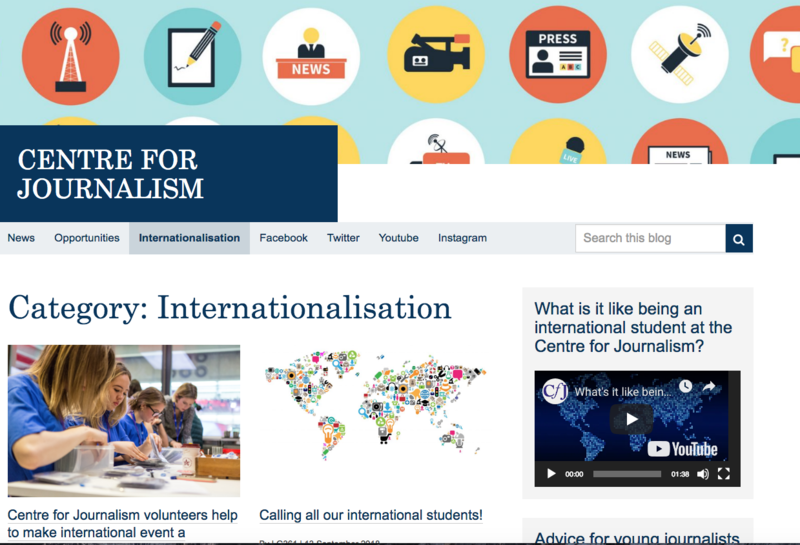 The Centre for Journalism's new blog for international students has won silver in the university's International Impact Awards. Created by our own Laura Garcia, the blog aims to highlight the experiences of our international students on our BA and MA journalism programmes for visitors to the main university web site. The award panel was particularly impressed with the interactive map that Laura created featuring videos from CfJ students and alumni all over the globe. With the award comes £1,000 to spend on internationalisation activities for the department. We'd be interested in hearing any good ideas from CfJ students out there as to how this might be spent to encourage more overseas students to join us, or to strengthen our exisiting alumni network. As many of you know, I’m not the most talkative in my University classes, so I thought I’d talk about something more personal to me in this blog post. Loud crunching, lip smacking whilst eating, tapping really loud on a keyboard, snoring and even breathing heavily. Most of these sounds would probably get rather annoying to anybody after a while. For me, however, the majority of these sounds are completely and instantly unbearable. Sky's Sophy Ridge, presenter of Sophy Ridge on Sunday, will deliver the 2019 Sky Bob Friend Memorial Lecture and present the 2019 Bob Friend Scholarship in the Historic Dockyard Church on Wednesday 6 March 2019. First, of course, we must select a scholar. So, there will be a detailed briefing for students who wish to compete for the 2019 Sky News Bob Friend Scholarship on Monday 14 January at 1300 in the main newsroom. This is a unique and immensely valuable opportunity open to undergraduate students in the Centre - first, second and third years. The winner will spend a month long, fully funded placement at Sky News. They will also receive a £3,000 contribution to their tuition fees. Beyond these rewards there is, of course, the prestige and glory of being a member of the tiny and highly select band of Sky Bob Friend Scholars. As the budding journalists of the future, Mencap is calling on all of you to enter our inaugural Journalism Awards. Mencap is a charity committed to changing the lives of people with a learning disability. All our services support people to live life as they choose. But they need your help. Although so much has changed over the years, more needs to be done to raise awareness of the challenges that people with a learning disability face and to help change attitudes towards learning disability. So, we are inviting you to enter our journalism awards. Full details, advice, contacts and guidelines on entering can be found below.